Would you like an unique 3D printed Dog Tag? You are at the right place. Whatever dog tag with custom text we can design and create for you. It only depends on your creativity what you want to see on it - pet's name, phone number, address, etc. Don’t forget an unique personalised 3D printed gift can always make a nice surprise for anyone. Bone Dog Tag with Custom Text. 3D printed product. The text can be anything and depends only on your creativity. Eg. : dog name, phone number, etc. 5.) Fill out your data then write us what text (eg. : name, phone number) you would like on the keychain in the "Comment" box at the "Confirmation" page. Do you have any question? Write us. Dog Tags. 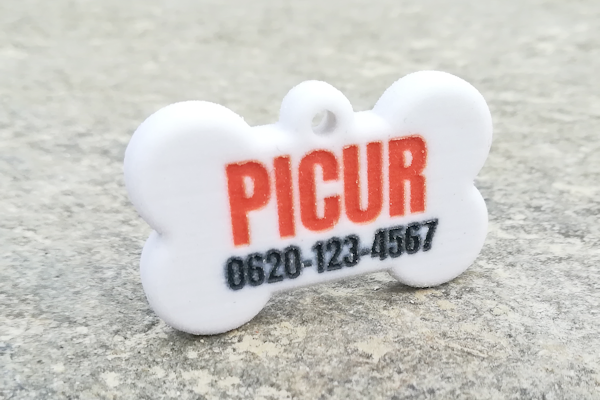 A cool personalised 3D printed dog tag is not only a practical way to pay attention to your pet but a trendy and fashion accessory. We can made any type of dog or cat tags with the help of 3d printing: bone, heart, circle, house, flower, stars, etc. A custom dog tag can be a funny and creative gift idea for your pet.